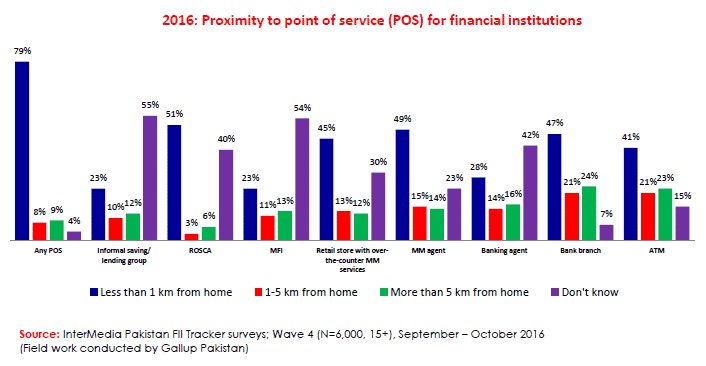 A majority of Pakistanis could gain access to digital financial services as they meet the necessary criteria for it. 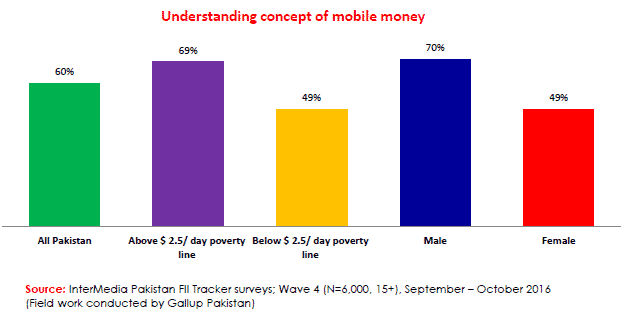 They only require basic documentation, a technological tool and basic financial knowledge, according to the Financial Inclusion Insights (FII) Survey by InterMedia (a global research and consultancy firm) and Gallup Pakistan. Among Pakistan’s population, 95% have the necessary ID and numerical skills while 77% have mobile phone access, which are basic requirements for financial services. However, financial literacy is under 20%, which is a challenge for advanced level utility of financial services. 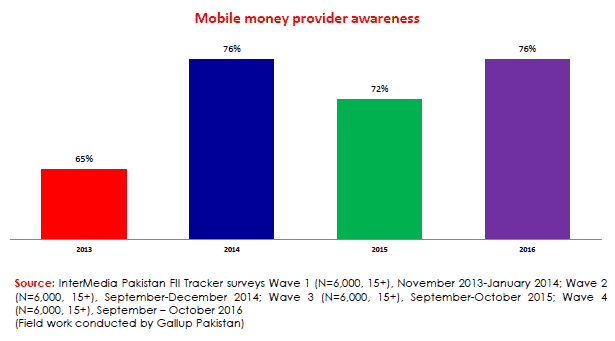 In 2016, Pakistan’s performance was relatively high on some precondition indicators, including awareness about mobile money (60%), SIM card ownership (52%), the ability to send or receive a text message (44%) and financial literacy (16%). These results indicate that a significant proportion of Pakistanis meet the necessary criteria to use digital financial services; however uptake of these services still remains low. Among developing economies, the concept of digital financial services is rapidly emerging for the financial inclusion of the underserved population by providing products that are tailored to the customer’s needs. 2 out of 3 women in Pakistan have access to a mobile phone but SIM card registration remains low at 27%. Mobile phone access and SIM card ownership for males in Pakistan has been fairly similar between 2014 and 2016. The ability to send or receive a text has seen a 9% increase among males for the same period. On the other hand, mobile phone access has observed a 9% increase for females in Pakistan between 2014 and 2016, and the ability to send or receive texts has increased by 5%. SIM Card ownership has decreased by 2% among females for the same period. 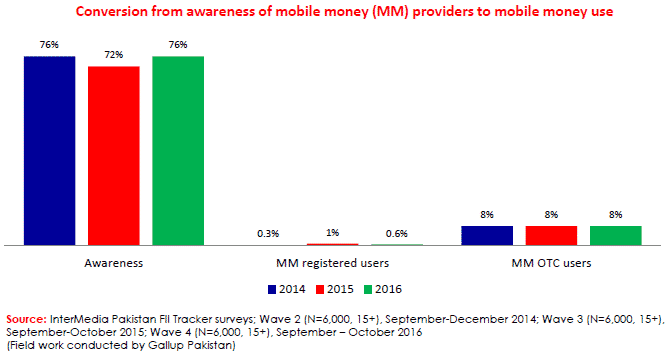 Female mobile phone access, SIM ownership and mobile literacy measured through the ability to send SMS, appears as the primary bottleneck in terms of Digital Financial Service use in Pakistan. Gender breakdown of the results shows that 70% of men knew of mobile money as a concept; 30% did not. On the other hand, 49% females knew of mobile money as a concept, 51% did not. These figures point towards a gender gap of 21% between males and females on the understanding of the mobile money concept. Across all demographic groups in Pakistan, levels of financial literacy have been low (under 20%), pointing towards a lack of knowledge and understanding of formal financial concepts. If the aim is to increase financial inclusion in the country, it is imperative to increase the scope of Financial Literacy Initiative to create financial awareness among the masses and educate the financially illiterate.